The actor: Philip Baker Hall may be known to most television viewers for a role he played for less than 20 minutes—the no-nonsense Lieutenant Bookman on Seinfeld—but in a career that spans more than 40 years, the actor has turned up in a staggering number of TV series and films, being directed by Robert Altman (Secret Honor) and Lars von Trier (Dogville), and co-starring with everyone from Jimmie “J.J.” Walker (Good Times) to Sam Waterston (The Newsroom). Hall can currently be seen in The Chicago 8, now available on VOD, and in Argo this fall. The A.V. Club: This is certainly not your first time playing a judge. 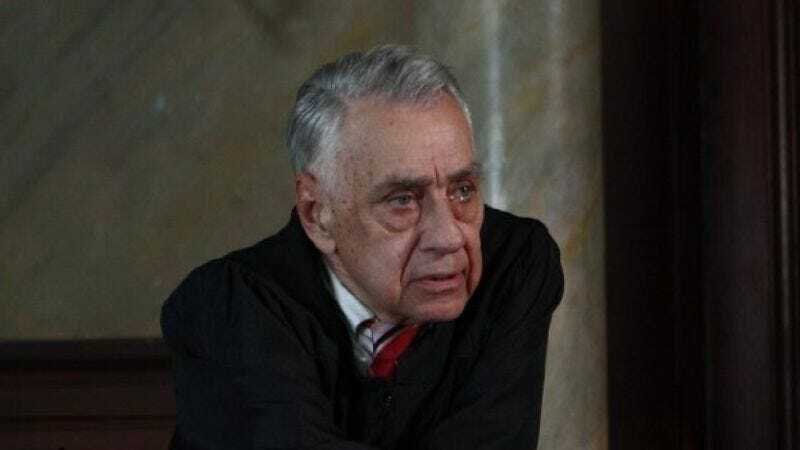 Philip Baker Hall: No, it’s not. [Laughs.] And as it turns out—and this is just how things work out in life—there was a play done at the Odyssey Theater in Los Angeles… I think in 1977 and 1978. Or ’79, maybe. One of those years. The late ’70s, anyway. But it was a play about the Chicago Eight, based on the transcripts of that trial. It was very successful, ran for a couple of years, I think, and at one point… I did not initiate the role, but at one point I took over for the actor who was playing the judge in that production and held the role on and off over a period of some months. But the two are not connected. Pinchas Perry, the director of The Chicago 8, offered me the role of the judge, and he did not know that, 35 years earlier, I’d played a judge in the theater production. So life has its own little twists and turns. You never know where things are going. I could not have imagined when I was playing the role of the judge in the ’70s that one day there would be a film many years later where I’d be playing the judge. So I have a history with this role, although it’s distant. AVC: So what was your knowledge of the Chicago Eight case as it was originally going on? Were you aware of it? PBH: Oh, sure. It was a big event. Even though at that time cameras—still, motion-picture, or TV—were not allowed inside a federal courtroom, it was a front-page type of event during the trial, so on the nightly TV news, every twist and turn was reportedly verbally, along with accompanying sketches that they were allowed to make. But it was a front-page story because the protagonists, Abbie Hoffman and Jerry Rubin and Tom Hayden, and, of course, the bad guy, Judge Julius Hoffman, were like superstars at the time. They were absolutely household names. It’s just so interesting looking back now that only those who follow these things or have a particular historical interest know or really much remember who these people were and how prominent they were in our lives, in our thoughts, at the time. I mean, that group, who demonstrated in these kind of sarcastic and witty and humorous ways against the war in Vietnam, had—along with many other factors—something to do with the fact that the war eventually ended. And with Judge Julius Hoffman, a federal appointee by, I think, Richard Nixon, we saw the role he played, which was to embarrass and shame anybody who demonstrated against the war. That was sort of his role. And, of course, we know that his judgments were overturned later, even though he was able to get convictions the first time around. But it was a huge event because the young men, by and large, were so appealing and so articulate and… God, they were fighting to stop a war, one that was killing thousands and thousands of people on both sides. So the public had an interest. And, of course, the judge is always interesting, especially if he’s corrupt or appears to have a personal vendetta, which this judge often did appear to have against the guys. So it made for great public theater, is what I’m saying, on the nightly TV news. It was big news on any given day during the run of that trial. It was probably the No. 1 story, because everybody wanted to be filled in: “What did Abbie Hoffman do today? What stupid and funny thing did Jerry Rubin do today?” It was all very dramatic. And I was as caught up in it as anybody else was… little knowing at the time that a few years later I’d be playing the judge in a play. And, 40 years later, I’d be doing it onscreen. So, anyway, I’ve had an interest in this particular trial, but I’m obviously not the only one. This was an American trial of great importance and great consequence. Maybe because of the television coverage, or maybe because of the nature of the young men, their innocence and youth and clarity and the fact that they were fighting for a good cause. But a lot of things about the power of the federal government stomping out smaller, less important voices, even if they were fighting on the side of right. So it dramatized that, I think, for the American public. It was an important trial. But trying to make a movie today that really recaptures that, that illustrates that and makes it clear how big a deal it was at the time, I think it’s really hard to do. I think we’re focused on so many… on all kinds of problems today. Whether this film can… well, I won’t say “rekindle,” because you’d have to be a person of a certain age for anything to be rekindled. But I hope it can impart to a younger generation the importance of the trial, the power of it, and where it could lead if we are not alert to what’s going on with some of these right-wing ideologues. AVC: Funnily enough, your first film was, at least to some extent, a statement against Vietnam as well. PBH: Yes, it was. God, that was in New York. Father Reis was the guy, I think, who broke in and dumped blood on the draft files. It was somebody I could identify with. But then I also played Richard Nixon. So I’ve played ’em on the right and on the left. PBH: That was for Robert Altman, and there were a couple of things involved there: First, the piece was a play, a theater piece, and it was already running when Altman came to see it. And then after he came to see it, he decided he would like to make a movie of it. Then we shot it, I think, in 11 days. But the play had been running for a number of months before that, so he didn’t tamper with it very much. He cut some parts of it out. He made some really judicious cuts, because it was quite a bit longer in the theater. He cut out about 20 minutes, which I think was very good. We should’ve done that in theater, too. [Laughs.] But other than that, he didn’t really mess much with it. What he did do, though, was develop a way to film it. His concern from the moment he decided he wanted to make a film out of it was how to film it. He didn’t have any cuts, because there weren’t any other actors involved, so he had to figure out what to cut away to without it seeming arbitrary. And then he had to devise a fluid way of filming it so that it didn’t look like a stationary camera with a single actor in a single room. So he happened to own this camera that’s like… it’s almost like an airplane. It’s on a big pedestal, about 8 or 9 feet high, and stands in the middle of the set, and it has a basket on it. And the cameraman, he’s in that basket and he has controls there. He can almost fly it like an airplane. He can go up and down and around. I think Altman told me at the time that there were only a few of those in the world, made by some watchmaker who lived in Canada. And Altman bought one, one of the few individuals at the time who could actually afford to buy a piece like that. If you’ve seen the film or if you watch the film thinking about that, he was able to get a lot of very flowing, fluid camera movement around the action of that single actor without it looking like a fixed tripod in the middle of the room, with lots of stops and starts. So we were able to do very, very long takes. Fifteen- or 20-minute takes with that particular camera set-up. It was really interesting. That’s really what he brought to it: a way of filming it. He really didn’t mess at all with performance, other than trying to figure out how to make each scene as good as we could and doing as many takes as we thought we needed to in order to get it up to what we felt was the best that we could do it. But it was mainly about how to make it seem like a movie and not a staged play. And that really is what his genius brought to it, I think. AVC: How did you first cross paths with Paul Thomas Anderson? PBH: I was doing a movie for public television, and he was a volunteer production assistant on that film. They actually had a program for young writer/filmmaker hopefuls, and he came in to do that, so he could see how it goes on a real movie set and be a part of the process by basically just helping out, carrying the heavy objects or the coffee, whatever. We met on that, and somehow we were drawn together. We had coffee and cigarettes between the takes and got to know each other a little bit, and it was obvious to an experienced actor that he was… unusual. Something about him was very different than the average volunteer production assistant. There was something of the golden child about Paul, even when I had not seen one line of his writing. Just talking to him and listening to him talk and getting to know him a little bit on the set, it seemed like this was not your everyday person. [Laughs.] Something was really shining through with him. And then he said, “I have this 30-minute film that I’ve written, and there’s a very good part in it for an older actor. Can I send it to you?” And I said, “Sure, I’d love to see it,” and he sent me a copy of “Cigarettes & Coffee.” And the writing was just absolutely astounding. I couldn’t believe what I was reading. I truly couldn’t believe it. By the way, Paul at that time was, I don’t know, 20, 21, or 22. But he looked younger, like someone who was maybe 14 or 15 or 16. He really seemed like a kid. So I’m reading this script, and I truly had trouble believing that that kid wrote this script. I mean, it was just so brilliant, resonating with nuance all over the place, like a playwright. Certainly, as a film, I’d never really seen anything like it. It was staggering. So, anyway, we went and made that film, eventually it got out there and was shown as a short film at a lot of film festivals around the world. At Sundance, they liked it and asked if he had a feature he’d like to workshop, and that’s when he wrote [Hard Eight]. Or, I don’t know, Paul is such a genius, maybe it was already written, just waiting for the right… I honestly don’t know. I think he wrote it after, but I can’t guarantee that. Maybe he’d written a version of it. Anyway, he sent me a copy and asked if I wanted to go up there with [John C.] Reilly. And Reilly and I had not yet met, although I’d certainly seen him in some of the early films he’d done. So Reilly and I met and ran through it a couple of times, and we went up to Sundance. Paul created a stir at Sundance with that script. A lot of people suddenly became very interested in Paul. I don’t know how they work it there now, but in 1995 or 1996, whenever we were there, they would have kind of a general reading in which everybody who was participating in any of the workshops was invited. And at that reading, I remember that it created quite a stir among all of the people who came to see us that night. AVC: The collaboration with Anderson obviously went well, given that he also brought you into the mix for his next two films. PBH: Yeah, Boogie Nights was fun. And then Magnolia… well, and Boogie Nights to a certain extent, too, because his reputation was really going full steam ahead, but in particular with Magnolia, you talk about Paul’s writing, virtually every one of those great roles was written for the actor who played it. From the Tom Cruise role, to Reilly’s, Bill Macy’s. And Alfred Molina’s. I think all of the roles were literally written for those actors. He tailored them right to the kind of feeling that he wanted those characters to have in the movie, which was an interesting way to go. Maybe back in the old studio days, that’s the way they did things, when the head of the studio would say, “Okay, we’ve got these eight actors under contract here, write a script for these eight guys.” [Laughs.] “We’ve got to use all eight of these guys, because we own these people.” I don’t know. I just know that most if not all of the roles were written for the actors. He knew what he was after there, no doubt about it. AVC: You are, it seems, the only person to have appeared in two films about the Zodiac Killer. PBH: Yeah, I was in a low-budget Zodiac movie which… [Starts to laugh.] That’s funny. I remember my agent said, when they wanted to see me for the big-budget Zodiac, “Well, should we tell them that you were already in a Zodiac movie? They might not want to see you if we tell them that.” So we discussed it, my agent and I, and decided that it would be best to just tell them. Otherwise, we didn’t want it to get out down the line and have them say, “You should’ve told us.” So my agent told them, and they said, “Oh, yeah, we know.” They knew before I had the meeting with them or even before my agent called. So I guess [David] Fincher’s assistants really do a lot of research before he goes to cast a movie. PBH: Yeah, they killed me. [Laughs.] That was really fun, so that was kind of a blow. I didn’t see that coming. Steve Levitan, who is the co-creator on the show, and he writes a lot of the scripts, when he told me that that would be my last episode, I was kind of in shock. And I asked him, “Why?” And he said that right from the beginning when they mapped it out—as they do these days on a lot of TV shows, even before the pilot is shown, they map out all the storylines for all the main characters, the complete arc of what that character’s line could be over a five- or six-year period, should they run that long. And when I said, “Well, I thought we were doing good here, that Walt had become a popular character on the show,” he said, “Well, yeah, but we had decided a long time ago, before the pilot was even made, that we wanted to do an episode where the boy lost someone close to him, but not a family member. A personal friend. But we didn’t want it to be a kid.” So they knew when they hired me. I don’t know whether they knew the exact episode, but they knew when they hired me that my character was gonna go in the not-too-distant future. Anyway, be that as it may, I enjoyed it while I was on. It’s always fun to have a good part on one of the best shows on TV. It’s a great show, and I’m grateful for the time I got to be on there. AVC: You’ve appeared in numerous different TV series over the years, but the oldest series credit attributed to you is that of a motel owner on an episode of Good Times. PBH: That is true. I think that may have been my first role when I came out here from New York. It was a two-parter. That was a Norman Lear show. AVC: How did it feel to transition from doing all of that theater work and at least a few films into doing a sitcom? PBH: Well, it was really disorienting. I came out from New York in… I think it was the ’74-’75 TV season. And I didn’t really have anything going out here. A friend of mine came out here and was doing well, and he called me and said, “You’ve got to come out here! They love New York actors out here! You’ve got to get out here fast!” I don’t know why I left New York. Looking back, I almost wish I hadn’t left New York. Anyway, I did come out and stayed with him for a few weeks, and then I began to learn some of the truths about how much they loved New York actors who came out with no agent and no prospects and almost no film in his bag. They didn’t. Not very much, they didn’t. I remember going around and trying to make contacts. One of the first things I learned out here in Los Angeles—and it may be true in New York now, too, but I don’t have the contact with New York that I used to, but—in New York, you could move around a little bit inside the industry as a beginning without an agent. It was possible. It was better to have an agent who liked you and got you out there, but even if not, it was still a situation in New York in the ’60s and ’70s where you could go to a theater where a hit show was playing, address yourself to the stage manager. I found at the time I first went to New York, in the early ’60s, that most stage managers were very helpful to young actors. You’d inquire if there was any role in the currently running show that you might be suitable for if that actor happened to leave to go make a movie or leave for another play or whatever. And at the time the stage manager of the hit shows both off and on Broadway were kind of receptive to young actors who had no agent and no real New York credits. But this is not quite true in L.A. Unless you look like Tom Cruise did at 23 or something. If you’re just coming out there, and you’re not in your early 20s and look like a Greek god, and you’re out there without some representation or at least some central film in your bag, I would have to say that you almost don’t have a chance. Or at least when I came out in the ’70s you didn’t. But people were at least respectful in my case, because I did have a sizable New York résumé, and I must say that most of the agents I saw were not dismissive. All of the agents, including all the big ones, William Morris and a lot of major agencies that I visited or upon whose doors I pounded, I found them very courteous. They would study the résumé, and they would agree that it was a real résumé; it was significant, I’d actually done things in New York for real and played important parts. But movies are a different world, and they were all quick to tell me that until I had film, I was kind of a non-person in Los Angeles and in Hollywood. They would all say things like, “Well, if you get a good job in a movie or if you get some good film, be sure to call me first, because I think you might have a future out here, but I just can’t in good conscience submit you for anything, especially at your age.” I was about 40 years old then. There’s a bottom line of money and career, and looking at me, they had to make decisions, and a lot of them said, “Judging by this résumé, you’re probably a skilled actor, I have no doubt, but there are a lot of people in line ahead of you.” I remember a couple of agents actually used that phrase: “There’s a lot of people your age in front of you who’ve been out here for 20 years, who actually know how this game is played, and who are very skilled in front of a camera.” And I must admit, I was not confident or skilled in front of a camera. I absolutely was not. When I got that first job… I believe Good Times was the first. It could’ve been the second job. I’m not sure, because I did a movie of the week for CBS with Martin Sheen in which I played his attorney. I can’t remember the name of it. But that may have been before Good Times. But in any case, in those first jobs, I was lacking in confidence, and I did feel, “There are things to be learned here, and I haven’t learned them.” And I wasn’t even sure how to learn them. It was the kind of things that, especially at my age, after so many years of working in the theater, you can’t study in the book or memorize or even ask somebody, “How do you appear relaxed and casual and yet get the job done in front of the camera with a hundred crew people looking on?” Not to mention the other actors, many of whom when I first started were probably prominent or even stars. You’ve got to deliver the goods, but you’re scared to death. Which I certainly was, at least in the beginning. I do remember that experience on Good Times, though. As I say, I remember it was a two-parter. And Jimmie “J.J.” Walker, he was a huge star at the time. I mean, if you remember that show, it was a popular show, and he was the star of a top-10 show. And he was… confident, to say the least. [Laughs.] I had to do scenes with him. It was difficult. He was impatient. He was doing his job, he was anxious to get on with it, and in his world, I was really a beginner. Anyway, that’s just a little bit of history on that. AVC: By the way, I believe that movie you were referring to was called The Last Survivors. AVC: You were right: It aired in ’75, and the episode of Good Times was on in ’76. PBH: Okay, so that movie was the first thing I did out here, actually. But that was a movie, and that’s different from live TV, also. Good Times was with a live audience, three camera, and that was really intimidating. Because there were people on both sides, moving from set to set, and it was pretty scary. As I say, I didn’t have a foundation in Hollywood. I hardly knew anybody. Just at the social level. I felt pretty isolated here, I really did. But let me tell you the reason I got cast. I don’t remember how I actually got up for the audition in the first place; I didn’t have an agent. I was just kind of drifting around the Hollywood jungle on my own. But somehow she heard about me. I was in a play when I first came out here, and that got me some notoriety. It was a play at the Los Angeles Actors Theater called Museum, and Ralph Waite—from The Waltons, which was still a huge top-10 show—was the star. He went off to make Roots for several weeks, and I replaced him as the lead in the play. And even though I didn’t have an agent, that exposure got me a lot of attention and a lot of inquiries and led ultimately to a lot of good things. Many good things. But as I said, I didn’t have an agent, so if you were wondering how I managed to do anything, part of it had to do with that play; because it was a great part, I got a lot of favorable response to it in the industry. I remember Dan Sullivan, who at the time was the main L.A. Times drama critic, coming back to re-review the play and giving me a favorable review. That kind of got things going. Anyway, when I went to Jane, I thought I had a good reading, but I was also well-prepped by other actors, who were, like, “Well, it doesn’t matter how well you read for Jane. If she likes you, you’ll probably get the part. If she doesn’t, you probably won’t. It doesn’t have a lot to do with how well you audition.” So I went, and I thought it went pretty well. I was nervous, I remember that, but I thought I read well. Knowing, however, what I knew, that her casting technique was kind of just based on maybe what side of the bed she got up on. [Laughs.] Maybe that’s true of all casting directors, I don’t know. But it’s a job I wouldn’t want. That would be a scary job. Too much power. But I had a friend who had a show years earlier who had used her as his casting director back before she became a legend, and he was still prominent as a producer, so I called him on the phone and said, “I had a reading for Jane today for Good Times, and I think it went well. I don’t know how it went in relation to the other actors who read, but I think I read well enough that, everything else being equal, I could be cast in this part. But I understand that Jane is capricious, and you have no idea which way she’s going to go.” He had given her one of her first jobs years earlier, so he had a connection of having helped mentor her when she was younger. So he gave her a call, and I remember he called me back and said, “You’ve got the part.” [Laughs.] I don’t know how he bent her arm or whether she was going to cast me anyway, but I did talk to her about that later. She mentioned it. She said, “Oh, I talked to your good friend Andy a couple of days ago,” and I said, “Yeah, did he tell you to cast me or else?” She said, “Oh, no, no, I was going to cast you anyway.” Well, I don’t know about that. I think that my friend Andy probably had 90 percent to do with it. Or if she was on the fence, he pushed her the right way, basically saying, “This is my old friend who I went to college with, he’s a good actor, and he’s trying to get going out here, so why don’t you give him this part, Jane?” That’s what I think happened, anyway. By the way, just one addendum to that is that I got that part, and the next morning a number of agents called to say, “Are you represented?” I didn’t go with any of the agents who called, but there were a number of sort of third-tier agents who were calling because I’d appeared the night before in a top-10 show in a prominent role. So right away the phones started to ring, and a little momentum began to gather in my Hollywood career. PBH: Mariah was the first series-regular role for me, and that really came about because of Secret Honor. That really was a direct result of that. Because now I had an agent and was submitted for that part, for James Malone. And… I was the casting director’s first choice for James Malone. However, that was an ABC network deal, so the casting director there did not have the power. The network really had the power. I was making this movie at the time, and I remember I read for [Malone], and the casting director said, “I think you’re really right for this, and I’m going to submit that you should be cast in the role.” In the meantime, I was cast in a movie called Three O’Clock High. That was produced by Steven Spielberg, actually, and that was shot up in Utah. So I went up to Utah for a couple of weeks, and I was supposed to be back to go in front of the network for Mariah, for the network to make their decision on whether I was the actor that they wanted to play the warden. Well, there was a snow problem in Utah. I think they wanted snow for a particular scene, and they kept getting the prediction that it was going to snow tomorrow… and tomorrow and tomorrow and tomorrow went on, and there was no snow. I think I was up there for two weeks, and then it was a third week, and then it was a fourth week. Meanwhile, I was supposed to open in a play in Los Angeles that had been in rehearsal for about a month and a half during that period when I was up in Utah. In fact, I couldn’t open in that play, and my understudy actually opened. And I couldn’t get back for the audition for the network for James Malone in Mariah! AVC: Still, it was apparently the first American TV series ever to be set in a prison, for what that’s worth. PBH: Yeah, well, it was shot up in Toronto, and the prison facsimile they built, the set they built on the soundstage for the prison, has to be amongst the most detailed prison sets ever built. It was unbelievable. I don’t know if they could’ve afforded to build that set in the United States, it was so detailed and so huge. It was quite a piece of work, it really was. It’s too bad that show failed, but that was a case where things got all mixed up with the time difference between ABC’s office in New York, the writer in Los Angeles, and the producer and the directors up in Canada. If somebody wanted to make a change in the dialogue, it had to go through the whole triangle, but because of time differences, things were often delayed, sometimes by a whole day, which meant maybe that we’d lost a day of shooting. It was incredible. Finally, the producer up in Canada, he started to say, “Screw it! We’re losing these days. If there’s a change, I’m gonna make it, approve it, or disapprove it. To hell with it.” So ABC is coming up to shut down the show, because, you know, who is this guy? [Laughs.] Then they replaced him after several weeks, saying, “You can’t make these decisions!” And he said, “Well, I made ’em! To hell with you!” It was a typical Hollywood network mess. ABC literally did spend $11 million setting that show up, and it was all gone in a matter of a few weeks. It was amazing. Absolutely amazing. And it was an attempt to do something that really had never been done, from a social entertainment/television standpoint. It was to explore the lives of the people who run a big state prison, so that’s the warden, the assistant warden, the prison psychiatrist, and the prison priest. Those were the main characters, and it was an attempt to explore the lives at the most human level of those people and how they have to live their lives on a daily basis and yet still be responsible to the population of the prison. Just conceptually, it was kind of radical for a TV series to explore that. And the original intention, I think, was to make it kind of a serious exploration of all the personal and social issues that people who were in prisons had to deal with. Kind of a noble aspiration, but one that went totally bananas, I have to say. PBH: Yeah, well, that… I don’t know what they were doing with that. That was an odd series. Also shot up there in Canada. All I remember is being out there in the woods somewhere, and they’d take us to some remote location, put a dead chicken on the table or something, and somebody would say—in the script, I mean—all these odd words, spirits would come in, and I was supposed to be the embodiment of the spirit… I mean, to tell you the truth, it was not a show that I watched, so I wasn’t into the mythology of it or the language of it. I guess it had its fans, but I did several episodes, and I couldn’t quite… I never quite knew where they were going with it. So I never understood the character. I was the physical embodiment of a spiritual presence, but was it a good presence or not? I don’t know. I never understood it. I get these amazing residuals from there every couple of months, though. 14 cents, 23 cents, one dollar and nine cents. And that’ll be for, like, 50 showings or something. [Laughs.] Very bizarre. Pretty weird. PBH: Boy, [co-creator] Will Gluck is certainly riding high these days, isn’t he? He’s got that new Michael J. Fox series, and I read that NBC bought the whole season, sight unseen. These days especially, that’s pretty hot. And great for him. Will is high energy and high ideas. I mean, if you turned Will upside down, a million good ideas would flow out. [Laughs.] Really, he’s one of those writers where stuff just keeps coming out of him. There’s no end to it. He’s a bottomless pit of really interesting ways to go. He’s resourceful and clever with his writing. So The Loop was great. I enjoyed every minute of it. I enjoyed working with Will, and the whole cast was great. We had a lot of fun doing that. It was fun on a daily basis, one of those companies where it was just fun to go to work. Everybody got along, and everybody was just waiting for Will to uncork the next string of “how could you have thought of that?” but great ideas. He is full of them. Will is amazing. Maybe the most amazing creative talent as a writer/producer/director that I’ve met since Paul Thomas Anderson. Really. Will has a gift, there’s no doubt about it. AVC: When you and I talked before, you were pretty adamant in your position that the biggest reason The Loop never really took off was because Peter Liguori [Fox’s president of entertainment at the time] didn’t like the show. PBH: No, he did not. And he wasn’t quiet about that statement. I mentioned this when we discussed this a few years ago, but one day he came on the set and was talking to Will, and I was standing right there, and Will said something, and Peter said, “Is that supposed to be funny?” Or maybe, “Do you think that’s funny?” And whatever Will said back, I do remember Peter saying back, “Well, I don’t like it. I just don’t like it. I don’t think it’s funny.” From that point on, I don’t think we had much of a chance. [Laughs.] And, again, it was another case where the network did make a pretty big investment in the show. They even gave The Loop two soundstages on the Fox lot at one point, building a great airline-terminal set for us. It was really just a brilliant set. It was great. But then they never promoted the series. I don’t think they ever spent one nickel on promotion. They never even promoted it themselves, on their own network, and they never made any attempt to promote it via the conventional ways, like newspapers or billboards or anything. So, yeah, Peter Liguori did not like it. PBH: Yeah, that goes back. It’s interesting how that film has had such a life since it was made. It’s a film that people still talk about and remember, even though it’s been almost 25 years. It’s a good movie, a well-done movie, with great performances from Ione Skye and John Cusack. AVC: Technically you’re in all three films, but your scenes were apparently deleted from the second one, and then for whatever reason you’re not actually credited in the third. PBH: Yeah. The first one was definitely fun. That’s a fun scene I had in that one, and I enjoyed that. The second one, I think [Brett Ratner] tried to recapture the excitement and fun of the first one, and he wrote a scene that… I don’t know where he was operating. After the tremendous success of the first one, he was flying high for the second one, so I remember he was still rewriting that scene in Rush Hour 2 when we shot it that morning, and it just didn’t seem to have the comic flair of the first scene. And if there was any chance that it might’ve taken flight, it was rendered impossible because the other half of the scene. The lead actor didn’t appear that morning. So it was me talking to nobody, because there was nobody there to talk to. The responses were read by a stage manager. So that scene, thank God and mercifully for everybody, never appeared. Just like the actor that morning. [Laughs.] In Rush Hour 3, though, he wanted me to be in it because there was something attached to his thinking that “you can say you were in all three!” So I said, “Okay, that’s great, so I’m in all three.” He’s a very amiable guy, by the way. He has a very casual approach to things. Extremely. High energy, but casual. On the third one, I even said, “We don’t know where this is going. After the second one, maybe we shouldn’t take credit for this.” So we exercised our right to appear in it but not take an onscreen credit for it. But it turned out okay in the end. PBH: Yeah, that was a fun experience. But that was a movie that Disney… well we had a situation. That movie got eight Academy Award nominations, and, of course, in the end it didn’t win anything, but once CBS allowed themselves to be cowed by the fact that somebody said, “Well, a lot of the facts here are not accurate,” the tobacco industry mounted a big campaign against the movie and accused the studio, Michael Mann, and the rest of the group of manufacturing some untruthful moments. Well, he didn’t do anything that hadn’t already been done in JFK. Nothing that was anywhere close to that kind of manufacturing. But Disney backed down. They didn’t challenge the tobacco industry on their right to create artistically, even though factually it may have been a little off. But it was in the spirit of the truth of what actually happened with the tobacco industry and their propitious lies about the safety of tobacco. But it was fun to do that movie, and we felt that, since it was a movie that aspired to a certain kind of social consciousness during its making, we all felt that we were doing a good thing. A chance to practice your art. It wasn’t cops and robbers; it was really the good guys and the bad guys. And we were the good guys. There was a feeling of really strong commitment on the parts of all the actors and crew and Michael Mann, especially, were involved with it; we were crusading a little bit. And then it was validated when the Academy Award nominations came out. But then the tobacco industry said it was all a bunch of lies. I say Disney could’ve gone forward, but they were intimidated somehow. The tobacco industry was pretty powerful even then. And maybe still are today, I guess. I don’t really know. But I’m proud of that film, and I’m proud of what we did in it. I liked that movie. AVC: Would it be fair to say that Lars von Trier is a different kind of director than Michael Mann? PBH: [Laughs.] Oh, yeah. That was an experience. We were over there for a couple of months, I think, doing that. I mean, he’s definitely a visionary. He does see the world in his own particular set of eyeglasses. In fact, I love his most recent film, the doomsday one. Melancholia. Yeah, I thought that was great. That really kind of knocked me out. I thought it was brilliant. Dogville, though, was on a more intellectual plane, I think, and what he was trying to do there was a little esoteric and probably a little harder for audiences to relate to. Nonetheless, it was great meeting him and working with a lot of terrific actors on that, and to see how a visionary other than Paul Thomas Anderson works and approaches material and sees the world. So that was a good experience, to get to work with him. AVC: You’ve worked with a wide variety of directors with some decidedly different artistic sensibilities. Not to get you to dish dirt, but has there ever been anyone who you really just did not mesh with creatively? PBH: Of these well-known directors, most of them… [Hesitates.] I think got along with all of them, really. Again, they all have different visions, different molds, different work habits and different ways of doing things and working with actors, or rehearsing or not rehearsing, more takes or less takes, but they’re all valid in the context of what each guy was working with or for, based on their particular vision. No, I’ve never really been at odds with any of these guys. I’m always able to kind of put myself in their position and try to see what they see. I actually do try to do that. I try to see it the way they see it, and if I do have a difference of opinion on how a scene should be played, or if it comes down to a line reading, which most of these guys are not into giving you line readings, but I’ve asked for them, anyway. I don’t have any particular false pride about line readings. A lot of directors will say, “I don’t think that’s quite the flavor or the tone we want here, but I don’t want to give you a line reading!” And I’m always like, “Give me a line reading! That’s fine. How about a line reading? How would you say it? How do you think it should be said?” I’m not advertising about how liberal I am, but it’s just that if you’ve done several takes and the director still feels that he has not gotten the scene where he wants it, it’s very helpful to know what he is seeing that you don’t see. So I invite them to line read. Most of them don’t. They won’t actually do it. But if they want to give me a line reading, it’s okay with me. And if we’ve done it several times, and we’re not where we should be, hearing what he feels is the correct cadence is often very helpful. “Oh, okay, I see what you’re saying.” And it doesn’t mean necessarily that I would have to ape his line reading, but it often gives me an insight into a way to go at it myself to get where he wants to go. Because sometimes it is a little mysterious. Some directors don’t say much. Michael Mann, for example. I remember on The Insider he never had much to say. He would do a scene, just kind of nod, and then set it up to do it again. And you might do a scene 10 or 12 times or more, the same little 31-second bit. And you could tell he wasn’t satisfied, but he wouldn’t say much. Also, with a director like Michael Mann, you never know what he wasn’t satisfied with. Was it the acting? And if it was, was it you, was it Al Pacino, was it Christopher Plummer? Was it the cameraman, the sound guy? You don’t know. Or was it something that he himself wasn’t conveying to everybody? I don’t know. He wasn’t very communicative, I would just say that. He was very gentle, very courteous, but you never were sure what he wanted in a take. And when, after doing 15 or 20 takes of a particular little moment, he finally said, “Okay, let’s move on,” you were never quite sure what he saw in that take that he wasn’t seeing in the other takes! [Laughs.] But, hey, life goes on. AVC: Over the past couple of years, you’ve made appearances in some unlikely places, including episodes of Warren The Ape and Childrens Hospital. PBH: Oh, yeah, I like these really off-center parts that are so ludicrous that you almost can’t believe them. [Laughs.] It’s always fun to take those kinds of parts and play them with as much serious passion as you can muster, even though they’re completely ridiculous on the face of it. I love to do that. PBH: Yeah, Bookman, Seinfeld. God, that was over 20 years ago. It’s hard to believe how long ago that was. It’s just so ironic. I mean, every actor has to deal with this, but I’ve played so many roles both in theater and on film—and when I say “so many,” we’re talking a few hundred—but the one that’s most often mentioned with my name is Bookman. And wherever I go, even if I go out of the country, Bookman is an identifiable character. I mean, it’s shown all the time. The reruns are shown on TV at least a couple of days a week, sometimes hour after hour of Seinfeld, so they’re out there. But the character… he’s a fun character, and I guess kind of an unusual one for TV, but everybody knows Bookman, no doubt about it. I’m not putting it down, but I’ve done so much else. But Bookman is the one that everyone remembers. People will say forever, at the supermarket or wherever, it doesn’t matter where, “Oh, you’re Bookman, right? I really loved that Bookman. Now, I know you’ve done a lot of other things, but I loved that Bookman character.” When they say, “I know you’ve done a lot of other things,” it’s like, “You don’t know the half of it!” [Laughs.] But Bookman? Bookman hits a response button. And I’m not ungrateful for that. Before Bookman, I had a long theater career, I was making a really good living in TV—I’d even been a regular on a couple of series—and I’d done quite a few movies, but Bookman absolutely exploded my career. I can’t deny it. Before Bookman, my agent would say, “Well, they really liked your work, they really love you, but they don’t think you’re right for this,” or whatever. After Bookman, there was no door closed to me in the industry. My agent would say, “Everybody wants to see you. Everybody wants you to be in their movie, everybody wants you to be on their show.” It was kind of incredible, I have to say. It was pretty amazing. So I’m not putting it down. It’s just that when people say, “I loved you as Bookman,” I can’t help but think, “But what about the other 280 roles I’ve done?” I don’t say it, though. [Laughs.] Because with Bookman, I kind of hit the jackpot. You know, because it was so eventful, career-wise, in my life, I can still remember that audition. I remember going in for it. And first of all, I did have a copy of the script or the sides or whatever, and I was kind of amazed at the depth of the role. Seinfeld wasn’t writing roles that big for the guest actors. Or that varied, that interesting. So that was surprising. And then when I walked into the waiting room for the audition, there were a number of prominent actors sitting around the room, waiting to go in. I can’t remember any names now, but they were all actors who’d been prime-time series regulars, and they all had pretty good profiles in the industry. Probably a higher public profile than I did. So I remember walking in and feeling a little intimidated by the star power I saw sitting around the room. But then I went in to read and—by the way, that was episode 22, and Jerry was still reading with the actors. So it was the director [Joshua White], Larry David, and Jerry Seinfeld, just the four of us in the room, and I remember that none of them could stop laughing. They just couldn’t stop laughing. They were, like, choked up with laughter. And it was one of the few times that, when I came back from that audition, I told my wife… in this business, we normally don’t count any chickens before they hatch, but I said, “I got this role. They will be calling soon. I got this role.” And an hour or so later, they did call and offer the part to me. It was a memorable day. PBH: Larry David is a really great guy. I like Larry. He did a feature while Seinfeld was still on the air, and he asked me to play his boss in that, which I did. And then, of course, he’s had me on Curb Your Enthusiasm a few times. And now he’s getting ready to do a feature that I think HBO’s going to produce, and he actually contacted my agent to find out if I’m available to appear in that feature… whatever it is, wherever it is, whenever they shoot it, if they shoot it. But anyway, out of that original Seinfeld thing, we’ve developed a… I don’t know if I can say “friendship,” because Larry and I are not meeting for coffee every day. [Laughs.] But we have a professional relationship that’s well over 20 years old. Almost any project that he’s been involved in, he’ll try to get me in there somewhere. PBH: Oh, yeah, that was fun, doing those. And I think [Aaron Sorkin] may be directing something else that I may be doing also. I can’t get into it yet, but I think he may be doing a feature that I might be in. But it’s fun working with him. He’s so experienced at working in his sort of political Aaron Sorkin medium that it’s pretty easy. He knows what he wants, he knows what he needs, and you know what he wants, so it’s a real good coming-together. I enjoyed the experience of working with him. AVC: So do you have a sense of humor about the fact that you’re so often asked to play ostensibly humorless figures? PBH: Well, I’ve done so many comic roles, too, over the years that I’ve balanced it out. So it’s okay. Also, those guys are often pretty interesting to play, because they often have their own odd little sides to them that can be explored and that are fun to work with. So, yeah, I’m cool with whatever comes my way. I’m just happy to still be working and to have been able to do it this long. It’s a privilege.